This SPACIOUS 2 BR 2 BA corner Condo is the largest at Kona Shores (1,000 sq ft of living space) and the only 2 BR 2 BA unit at this facility; it is referred to as "the Penthouse of Kona Shores" by long-term residents. This CORNER Condo has a good partial OCEAN VIEW (best at Kona Shores) from the living room and deck. It is in the most private section of the complex. Open the front door to a hardwood entry hall, then after passing the kitchen, step-down 5" to a living room surrounded by glass; look out to palms and gardens to the North--and the ocean and more landscaping to the West. The living room has sliding glass doors to north and west portions of a 400 sq ft WRAP-AROUND LANAI. Enjoy eating and relaxing at the confluence of north and west decks--and taking in the views including tops of Golden-fruited palms complete with green day geckos. On the north lanai there is a shelver with swimming and snorkeling supplies, ice chest(s), and sometimes boogie boards. There are 3 wall air conditioners: one in the living room near the kitchen; one in the MA Bedroom; and one in the 2nd Bedroom. In the MASTER BEDROOM you will find a King-size bed, 1 "Queen" wicker chair, one lounger chair, a chest of drawers, Hawaiian decorations and a glass slider and windows to the North landscaping, which drops off 30 feet to the back of a parking lot of the complex next door--no buildings interfering with your privacy in this bedroom! The Master Bath has a jacuzzi tub, make-up table and a large double closet. The SECOND BEDROOM is at the opposite end of the unit from the MaBR. It has two twin beds, a chest of drawers, and a glass slider-door onto the covered West deck (lanai). Clamps and linens are provided in the closet to convert the twin beds into a king-size bed. This bedroom is entered via a small foyer near the main door. At one end of the BR is a door to a FULL BATH having sink, high shelf-stacker for linens, and a tub-shower. The double-closet fills most of one wall. There are small step-downs when entering the living room and the foyer to the 2nd Bedroom. ADDITIONAL SLEEPING is in the living room with a sofa-bed. Linens are provided in the MaBR closet or in 2nd BR closet. Eating outside with private views of tops of golden-fruited palms complete with green day geckos is pleasant and relaxful. This condo is a top floor (second floor) unit--no noise above you! The ASSIGNED PARKING SPOT is in a secluded section of the grounds directly down 1 1/2 stories. You'll have no trouble searching for a good parking spot! The commercial-style laundry is down-stairs on the way to your car. The BBQ area and fantastic ocean-side POOL are on the Western border of the property; the pool is perhaps the best for SWIMMING (big enough) and VIEWS (waves breaking and great Sunsets) along all of Allii Dr. The Condo is at Kona Shores, which is 1 miles south of Kailua village (and immediately south of a larger complex, Sea Village) on the OCEAN-SIDE of Alii Drive. It is in the northwest corner of the facility--furthest from the road and nearest the ocean. 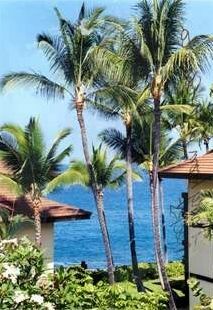 The address is 75-6008 Alii Dr., Kailua-Kona, HI 96740. We also have a tropical garden 1 BR Condo (VRBO #9673) in the same corner; and a private Studio Condo (VRBO #10597) next door if you need additional accommodations. Pets are NOT allowed, No Smoking in unit or in Lanais. Over the years Glen traveled to Hawaii many times, mainly Oahu, Maui, and Kauai. Ginny and Glen went to several Hawaii islands on their Honeymoon in 1985. (Picture is at Kona Village) We have owned a time-share in Waikiki, a lovely condo at Poipu Beach in Kauai, and several vacation and long-term condos on the Big Island. Our favorite place to visit became Hawaii for the sports (e.g. snorkeling), sites all over the island, variety of scenery, birds, and the fact that this island is not yet ruined by Tourism and population. We now own properties only in KONA. This was a beautiful condo. There were tons of pool and beach stuff. The decor was really pretty. The tub and shower in the master bath was the best I've ever used! The condo was well supplied: towels for shower, pool and beach; ziplocks, plenty of dishes, toaster and toaster oven. There was butter in the fridge and some waters, tupperware, plenty of pots, pans and cutlery. The glass on the floor was super cool. There were ceiling fans in every room. The master bed was super comfortable. Books for kids and adults were provided. There was a beautiful view from the lanai. This is an upstairs condo. I have 3 year old twins. Unfortunately they were super excited about getting to Hawaii and were running around a bit, causing some distress to the downstairs neighbors. We spoke to them and apologized and tried to keep them quieter after the first night. Hopefully we did not disrupt their vacation too much. We would totally stay here again were we to return to this island. It was a good home base for our first trip to Hawaii. BEAUTIFUL View! Clean, Convenient location, & Easy to work with. VRBO was very easy to work with and communicated well. The owner was also very easy to work with and quick to get back with me. The information was spot on accurate, nothing misleading. All the conveniences of home including everything you need to cook with, beach towels, and laundry. View was fantastic and the pool was nice also with a stunning view! The deck was a great place to sit, have breakfast, and once again, enjoy view. The master bedroom doesn’t have a door so if you have someone sleeping on the pull out in the living area, don’t plan on privacy but it was okay. We all thoroughly enjoyed our stay. I would stay here again with my family or come back with only my husband. This condo was perfect. We stayed June 27 - July 3, 2018. It was centrally located for adventures and has access to everything you would need. The welcome Kona coffee package was a nice treat and a must for each morning greeting of the geikos on the balcony. The owners keep the condo stocked with random things you need but don't think to bring or isn't optimal to bring with you. For example Cooley cups, ice Coolers, body boards, beach towels, and snorkels down to q tips, laundry soap (and facilities), reusable grocery bags and cooking seasonings. I give this place a 100 stars. It's dated a bit but absolutely perfect and has the Hawaii beach feel. We will return soon. PS. The pool is fabulous and peek a boo view is amazing. if the islands are calling you,stay here you won't be disappointed. Spacious, well-located condo, great for sunset viewing! This roomy, bright, retro-style condo is centrally located in Kailua-Kona, near the shops and restaurants to the north (Lava Java's happy hour was our go-to on Ali'i Drive!) and lovely beaches, coffee plantations, villages and the gorgeous Punalu'u black beach of to the south. There's a fun Sunday market in the village of Captain Cook - not to be missed for its laid-back island vibe. The condo provides snorkel gear, boogie boards and fun beach items for kids. There are lots of guide books and printouts of the area's features on the bookshelves - be sure to check them out. The wraparound lanai offers privacy and a beautiful partial ocean view from which to watch glorious island sunsets. The pool is lovely. Try a morning swim and hear the waves roaring in the distance. Then come back and leave a slice of orange on the lanai for the geckos. Get your camera ready! The owner is friendly and attentive. For instance, we had no WiFi upon arrival, but the situation was efficiently dealt with. The laundry room on the first floor is clean (pro tip: bring lots of US quarters for the laundry or start collecting them on your arrival!). The parking is close to the unit. This is a good place for a family or for couples vacationing together. Mahalo for a beautiful, relaxing first visit to this island, Glen! We hope to return to your condo someday soon. Reservation & Security Deposit of $200 is not to be subtracted from Final Full Payment; returned after visit Ironman Dates are High Season Keys will either be: 1) accessed in Lock-Box at Unit--Upon departure RETURN KEYS to Lock-Box; or 2) Mailed directly to your home address--After departure please mail keys as soon as possible to Owner. Cancellation Policy: Deposit will not be returned if cancellation is within 60 days of arrival date. Rental payments will not be returned if within 30 days of arrival date.